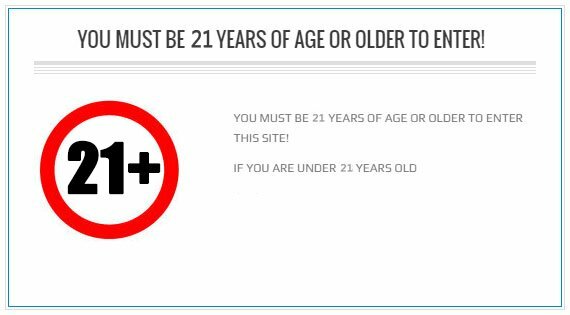 Add Increments of 6 to the Cart. Each Box Contains 6 Packs. Havana is a bold tobacco flavor mixed with soft creamy finish. Honey Dew Melon is an energizing and very sweet juicy honey dew melon from start to finish. Minty Menthol is a refreshing peppermint with a cooling menthol finish. Original Red is a robust earthy and aromatic red tobacco. (1) Original Red: Original Red is a robust earthy and aromatic red tobacco. (1) Minty Menthol: Minty Menthol is a refreshing peppermint with a cooling menthol finish. (1) Havana: Havana is a bold tobacco flavor mixed with soft creamy finish. (1) Pink Passion: Pink Passion is a tropical fruit mix with a sour passion fruit at the forefront with a sweet juicy guava for the finish. Imagine chillin poolside ripping a perfectly balanced hit of freshly ripened strawberries. The coolness splashes over you like the ultimate tube ride barreling over you with a crisp refreshing fruity essence. No added sugary creamy BS! Just the freshest strawberries. Simplicity at its’ finest with no compromises. An all day vape intended for your favorite pod system and loaded with a SaltNic punch. Summer Strawberry will have you dreaming of an endless summer! Mighty Mint - Mighty Mint SaltNic e-liquid is a perfect flavor for those who are more inclined toward the more simpler flavors and want to savor a pleasureful chilly frost of minty deliciousness. Mighty Mint SaltNic is for low wattage refillable pods, and is available in 25mg and 50mg nicotine strengths. Dry Tobacco - Whether you are a transitional vaper who just made the switch or someone who enjoys the flavor of flue cured tobacco, you will love SaltNic Dry Tobacco. 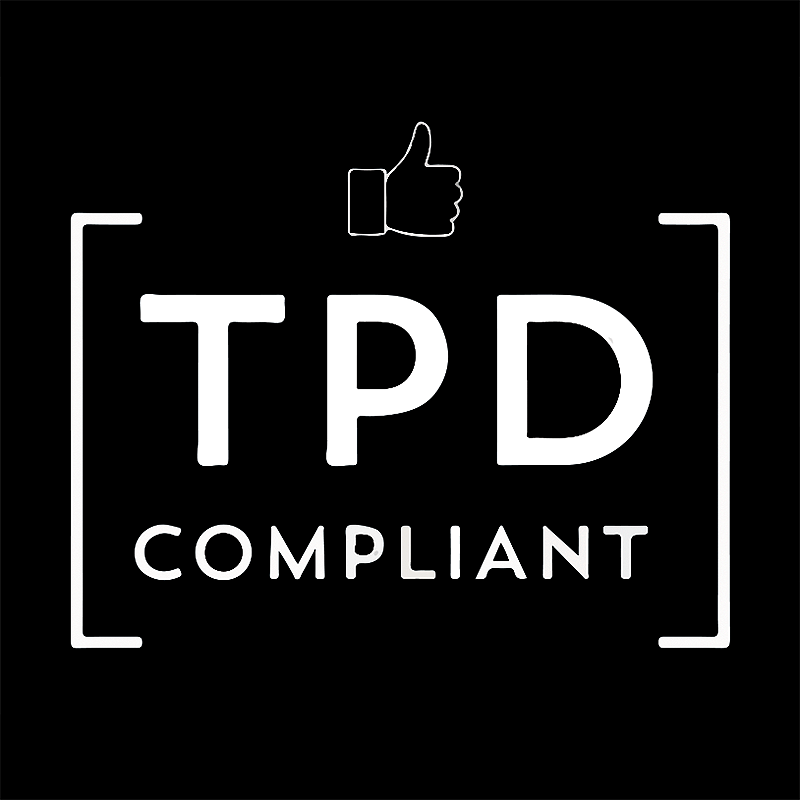 Designed with low wattage devices in mind, Dry Tobacco offers a genuine taste reminiscent of your favorite brand. Melon Mix - Imagine a medley of ripe melons freshly cut and mixed in a bowl and you will understand each draw of Melon Mix by SaltNic. Designed with low wattage devices in mind, you can enjoy melon goodness all day long. Tropical Mango - Huge mango flavor in a small pod. 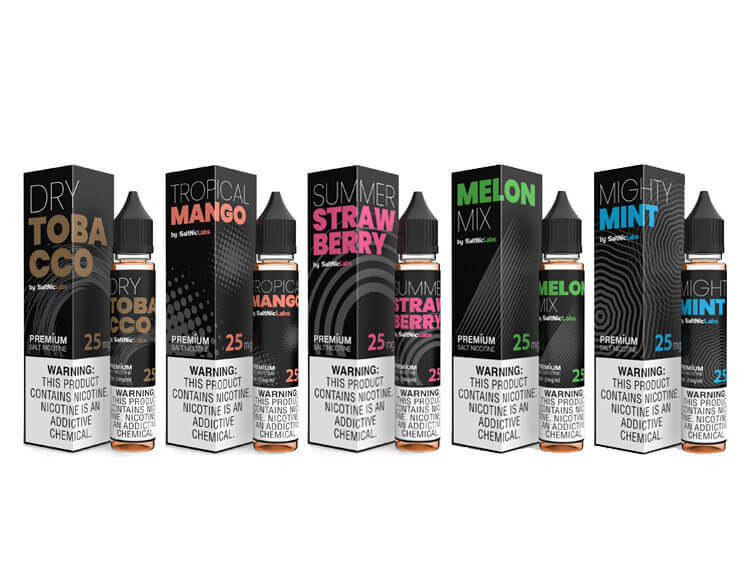 Created for your favorite low wattage device, Tropical Mango by SaltNic offers everything you love about mango, accented with other delicious tropical elements, bringing you satisfaction all day long. Cubano Silver - VGOD Cubano Silver SaltNic e-liquid is for the tobacco flavor enthusiasts. It is a classic Cuban cigar as the primary note mingled with creamy custard, hints of vanilla, brown sugar and honey. The SaltNic kick is excellently smooth and provides long lasting satisfaction. Cubano Silver SaltNic is for low wattage refillable pod devices only, and is available in 25mg and 50mg nicotine strengths. Cubano - Your favorite Cigar topped off with a drizzle of Vanilla Cream is now available for your pod mod in both 25mg and 50mg SaltNic for a rich and satisfying vape. Cubano Black - More robust tobacco, more rich and creamy vanilla custard, and more nic for your low wattage device. In 25mg and 50mg SaltNic and Back in Black, Cubano Black delivers. Luscious - Our Delicious Burst of Fresh Watermelon with sweet undertones of Mixed Melons formulated to bring the most out of your low wattage device. Be it 25mg or 50mg, your vape will be Luscious. LushIce - Our signature watermelon candy flavor climaxing with a fresh breeze of menthol elevated with SaltNic, in 25mg and 50mg, it will to bring your favorite low wattage device to life. Pink Cakes - With SaltNic, in 25mg and 50mg, enjoy a small piece of paradise cake with huge flavor in your favorite pod mod. Mango Bomb - Mango Bomb is a blast of a delicately sweet, yet rich and juicy slice of mango from the onset straight through to the exhale. It is a completely smooth and gratifying tropical treat that will reinvigorate you all day long. Berry Bomb - Berry Bomb kicks off with surging sweet strawberry freshness as the primary note with a sourish middle that leads to a candy coated sour strawberry belt for the finishing note. 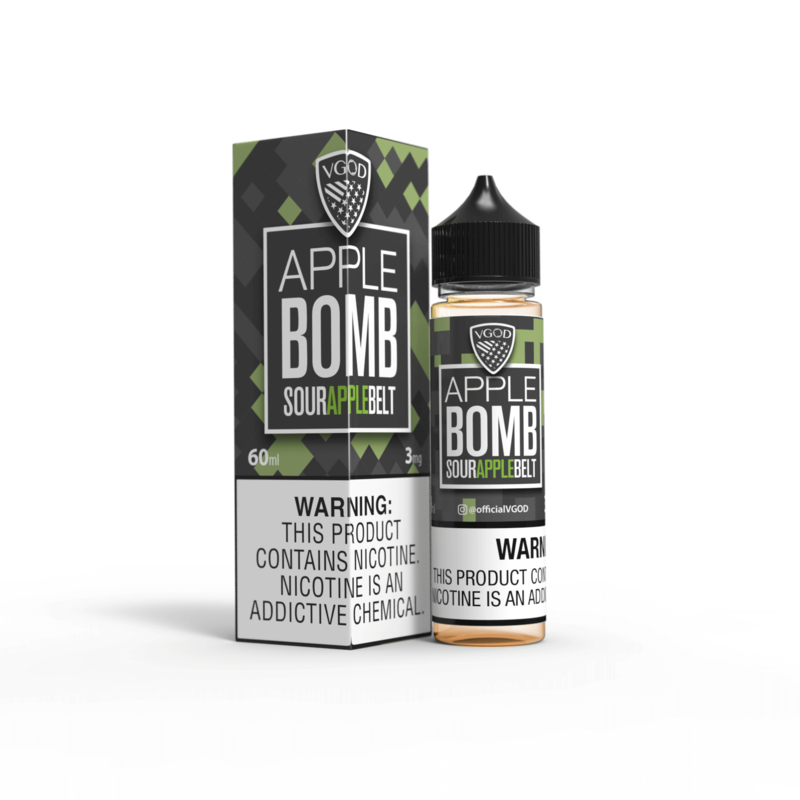 Apple Bomb - Apple Bomb is a crunchy bite of a fruity Granny Smith sour apple with splashes of tart throughout the inhale blended with a sugary sour apple belt on the exhale. Iced Apple Bomb - VGOD’s Iced Apple Bomb SaltNic is a crisp bite of a Granny Smith apple gushing forth with fresh juicy sweetness mixed with a tart tickle to the back of the throat that rounds off with a candy coated sour apple belt and a cooling iced menthol finish. Iced Apple Bomb is a magnificent sour apple menthol flavor for low wattage refillable devices only and is available in 25mg and 50mg nicotine strengths. Iced Berry Bomb - VGOD’s Iced Berry Bomb SaltNic is a deluge of delightful tangy strawberries ripened to perfection and wrapped in chewy sugar dusted sour belt candy with an invigorating iced menthol finish. Iced Berry Bomb imparts a satisfyingly sweet, but tart berry flavor with smooth and cooling throat hits for all day satisfaction. Iced Berry Bomb is available in 25mg and 50mg nicotine strengths and is for low wattage refillable devices only. Iced Mango Bomb - VGOD’s Iced Mango Bomb SaltNic detonates tropical aromatic delights of a rich golden yellow, soft and fleshy juicy mango with a refreshing iced menthol finish. From start to finish, Mango Bomb is smoothly elegant and a completely revitalizing all day vape meant for low wattage refillable devices only. Mango Bomb is available in 25mg and 50mg nicotine strengths. VGOD’s Mango Bomb is an authentic duplication of the complex yet delectably sweet and tangy mango. From start to finish, Mango Bomb allows for a harmoniously delicious journey through a soft textured slice of a ripened juicy mango. Without question, Mango Bomb is astonishingly smooth, satisfying and outright flawless.. Excellent for fruit e-juice lovers looking for an exceptional mango flavored all day vape. 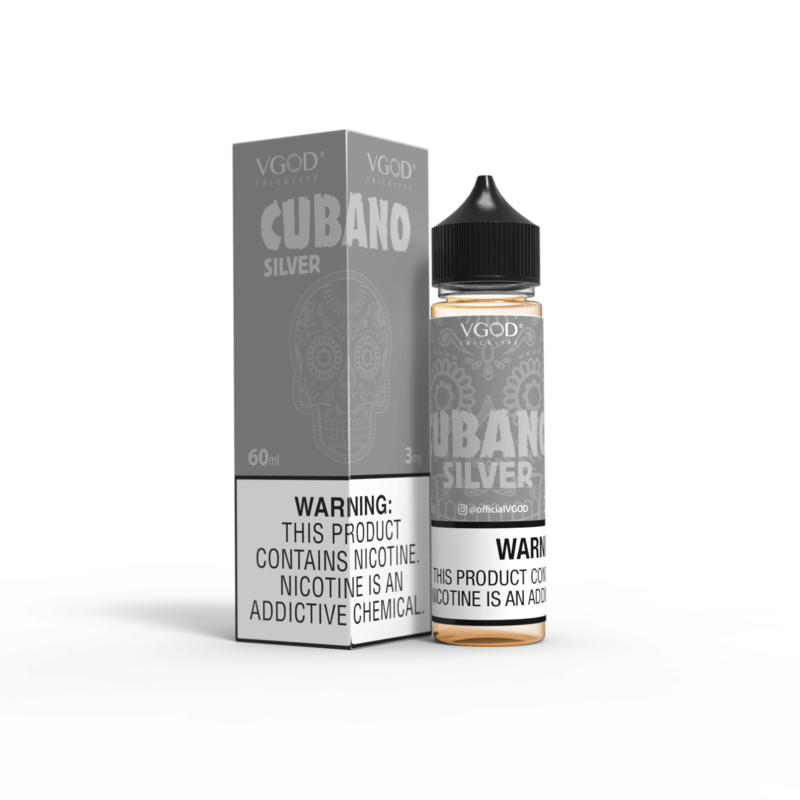 Cubano Silver is a complexity of flavors made for a smooth full flavored tobacco vape, just like its’ predecessors from VGOD’s Cubano e-juice line. It maintains in the forefront a rich, full bodied Cuban cigar tobacco flavor blended with a creamier middle ground of whipped honey butter vanilla custard, drizzled with caramelized brown sugar for a sweetened background finish. Cubano Silver is an amazingly refined, well balanced creamy vape that is not overly bold and will always be the peak of satisfaction. Berry Bomb, by VGOD Mixologists, is an outstanding sour strawberry belt flavor. It is an invigorating fruity strawberry on the start of the pull that becomes a pleasant mouthwatering tangy sour kick toward the back of the throat. On the exhale you get an explosion of candied strawberry flavor that has been perfected to not be overly sweet. Berry Bomb is a harmoniously well-rounded e-juice that captures the complexities of fresh and candied strawberry tartiness for all the strawberry lovers. Luscious by VGOD® is a delicious burst of fresh watermelon on the inhale with sweet undertones of mixed melons on the exhale, providing a bursting fruity all-day vaping experience! Sourlicious by VGOD® is a fresh burst of sour watermelon candy on the inhale with subtle undertones of mixed melons and sugar on the exhale, providing a bursting fruity all-day vaping experience! 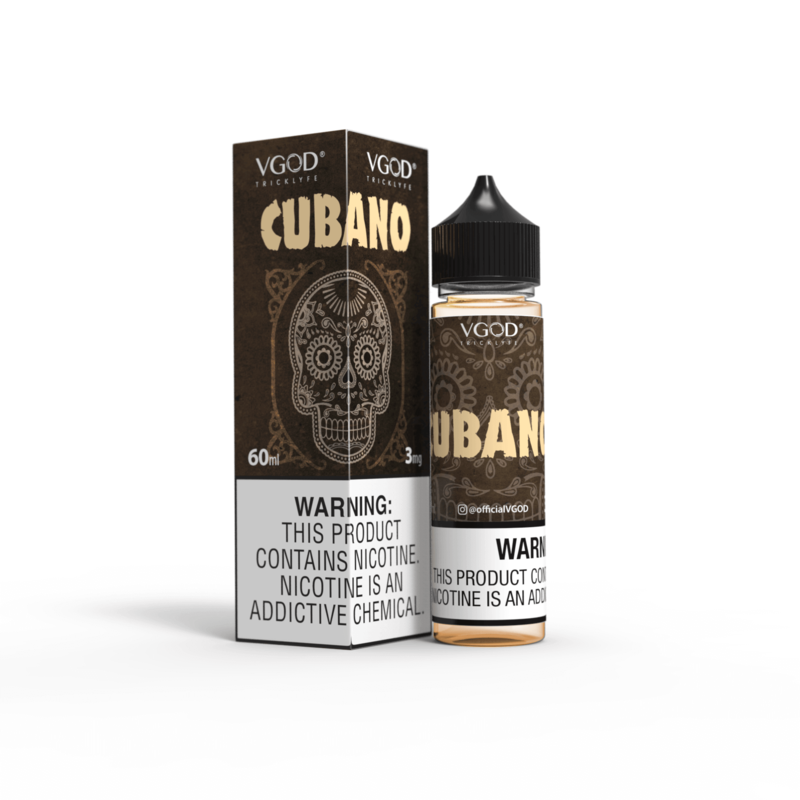 Cubano by VGOD® is a smooth Cuban cigar with a drizzle of creamy vanilla, providing a fresh and rich Cuban tobacco flavor! Now Available & Ships from UK! Each 60ml bottle is filled with the same outstanding flavor VGOD is known for, reformulated to take a 10ml nic shot if desired. Designed to work with any 10ml Nicotine Shot, enjoy your favorite VGOD Brand Premium Eliquids with a simple squeeze! Nice things come in SMALL packages!